AK47’s On the Afghan Border! Our first evening at Nomad’s Home was spent enjoying a few tasty beverages with some of the other travellers whom were in habitation. One character in particular had us looking wide-eyed as he told us some of his travel experiences! German George hadn’t been resident in his homeland for many years. He is currently approaching the end of his fourth year solo travelling the world and his only real plan was to make it to 5 years and see what happens. Germany held no tether in any shape or form for George as he had escaped East Germany during the dark days after spending 4 years in a gulag from the age of 18 for his outspokenness regarding the East German regime. The morning of Jen’s birthday arrived and with George taking the lead we headed off to a local restaurant for the required celebration, 3 tasty plates of local treats arrived promptly and with cold Ice Tea we toasted Jen’s slide that little further into the abyss! 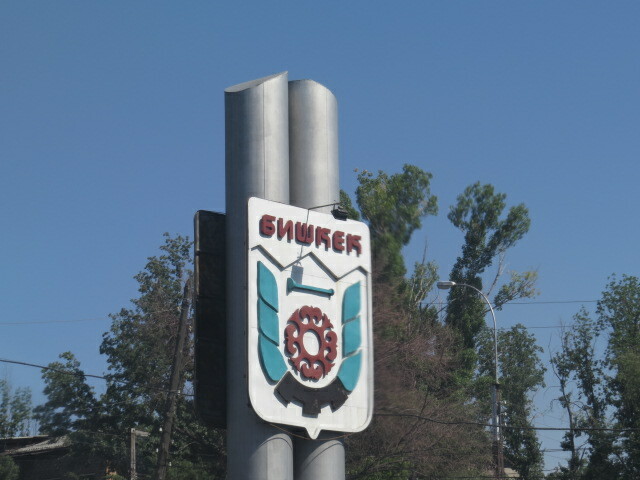 I decided to shout the table as it seemed to be the thing to do and $8.50 lighter, the bill was settled and we were on our way into Bishkek! An interesting enough City with the usual smells and sights associated with Asia, monuments and plenty of Police mixed with absolutely chaotic traffic. 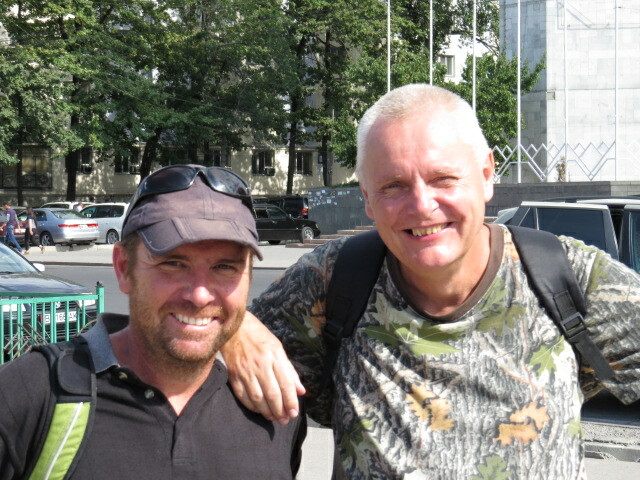 It was quite hot and we wandered for many km’s around the city center ticking off sights and the like as we went. Before we knew it the day was ending and we once again found ourselves back at the rear of Nomads attempting to help with the collection of aluminum for recycling. The following morning we headed off to the Uzbekistan Embassy and found ourselves on time and outside with a group of around 25 others. What a farce this process turned out to be! 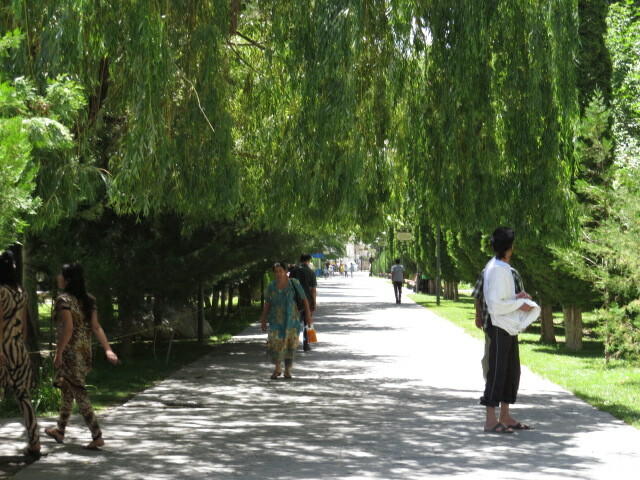 We knew what to expect as pretty well anyone that has enjoyed the experience of obtaining this visa in Bishkek is more than animated in either telling you first hand or plastering it on the web! Anyway this surly young woman eventually emerges from a door in the front of the embassy with a piece of paper and starts reading names from it at a volume that would require you to be within inches of her mouth on a windless day inside an eggshell lined room in order to stand any chance of hearing her. Now we are 15 feet away behind a steel fence with traffic behind us and water running along a storm drain! Anyway I won’t go on other than to say that a few hours passed accompanied by lots of the usual cue jumping but we did eventually obtain our visas. The only enjoyable part of the process was chatting to another in the cue who turned out to be an ex Australian Surveyor General. 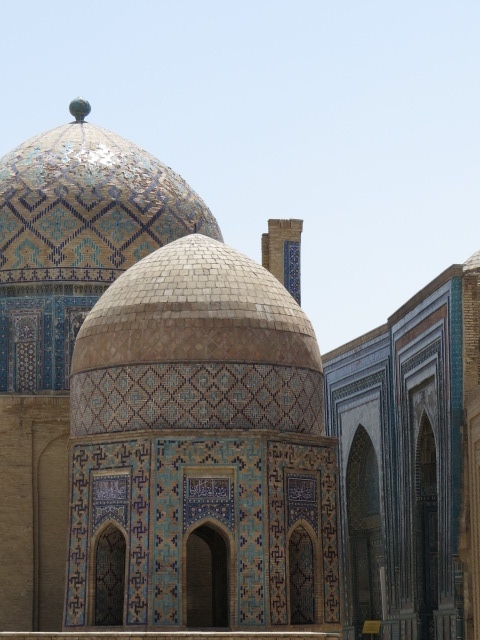 Our own clever Australian Government had decided that his passport alone wasn’t proof enough that he’d spent 2 years in Uzbekistan and wanted a letter from the Uzbek embassy to back it up before he returned to Australia permanently. 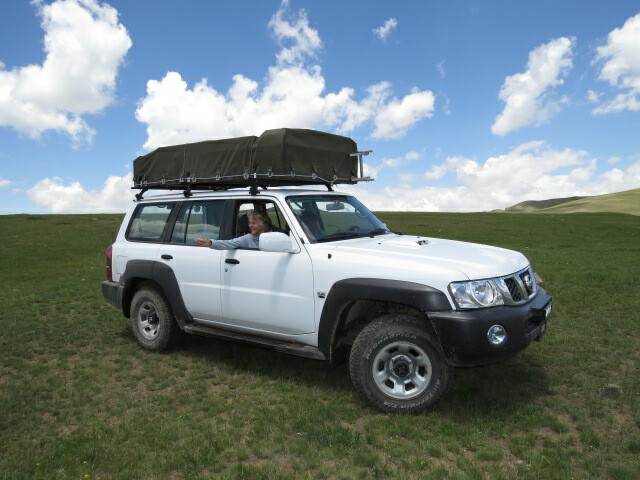 We had lunch with George once again at the establishment of the previous day and after goodbyes and a quick resupply of food and fuel, we left Bishkek in the rear view mirror. The drive was excellent and the black top was for the most part in really good condition for a change. 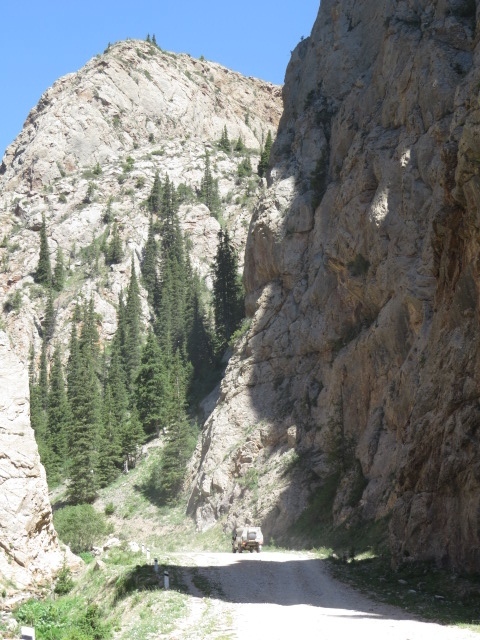 I was expecting the high pass that we encountered but was taken a little aback by just how beautiful the scenery was. 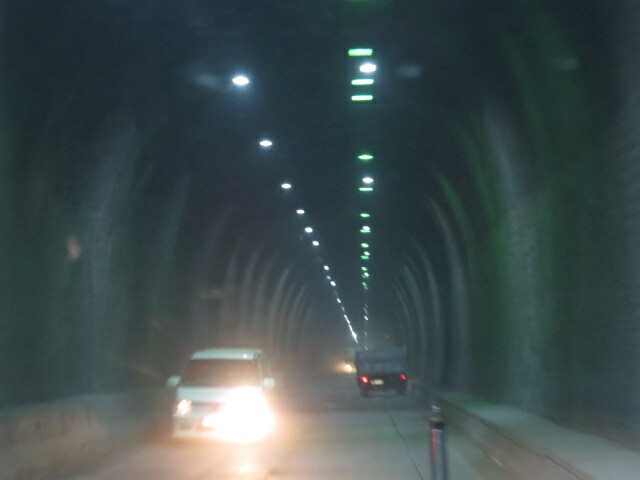 The rough hewn traffic tunnels caught me a little off guard however with no lighting, full of exhaust fumes and with just enough room for you and the oncoming Semi – Trailers whom of course do all they can to make sure you have enough room! 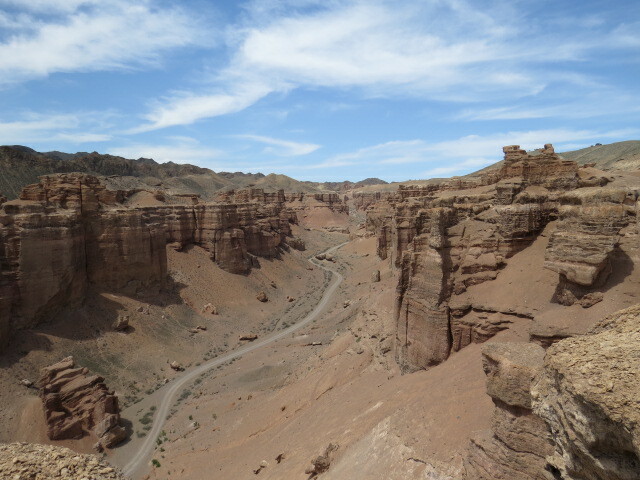 (sarcasm for those who missed it) The steeper sections of the highway were engineered with the now familiar switchbacks and second gear was often in use to make life a little easier on the Patrol as the weather was very hot and hence quite hard on the vehicle. It was good to see the locals sticking to the same ethos as always – get there as quick as possible without any real concern for the car! The circus continued as time and time again an old Mercedes or Audi would scream past us before slamming on the brakes at the next switch back and then on the gas up the mountain. 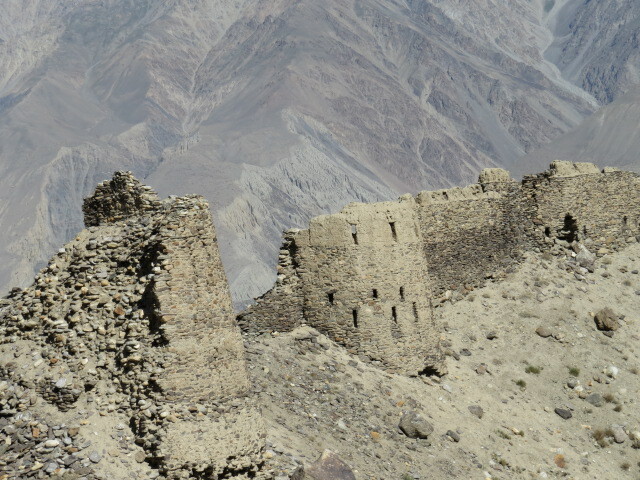 I couldn’t understand why we ended up passing nearly every one of them as we approached the highest section of the pass! Apparently they all needed to stop and lift their bonnets for an engine inspection and some appeared to be running on steam as that was generally the cloud being emitted from under the bonnets!!!! 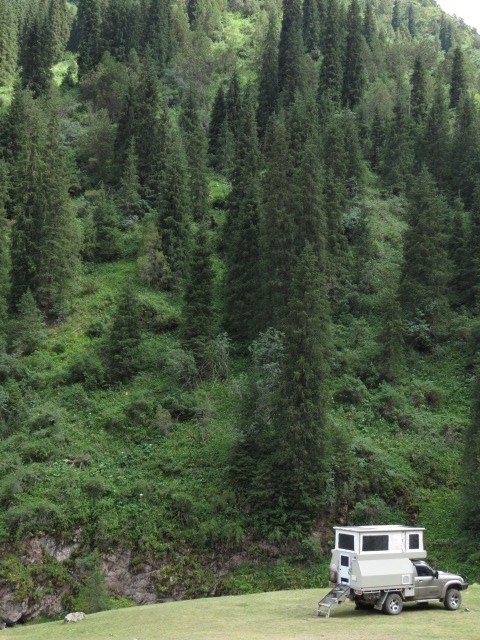 We travelled a little later than expected as we had some trouble finding a suitable campsite. 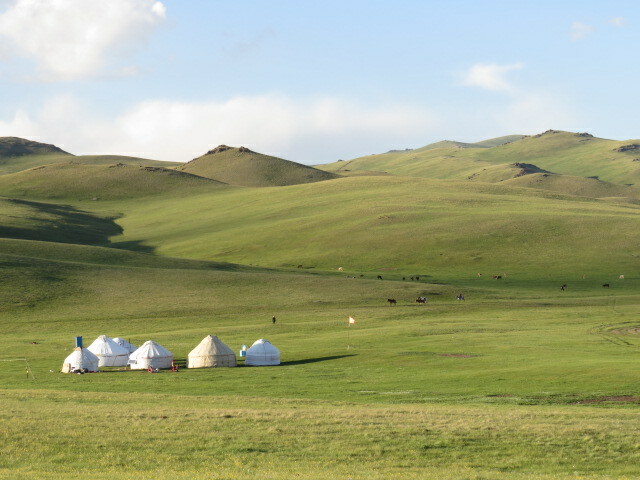 There were yurt camps littered along the highway and in between them steep valleys that didn’t really provide us any suitable options. Eventually we found a steep disused track down to a lovely but very fast flowing and noisy alpine creek and although close to the road, we were completely out of sight to passing traffic. 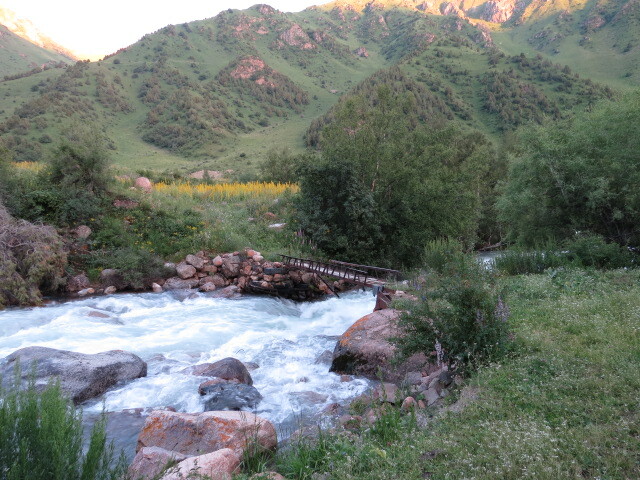 Right next to our chosen location was a little rickety footbridge that was obviously receiving some intermittent use and I was sure we weren’t far from a yurt camp but nothing could be seen. 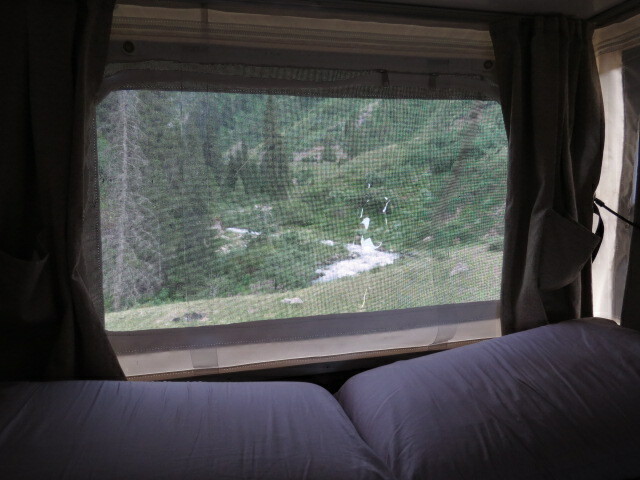 A relaxing nights sleep was had, upon waking in the morning Jen exited the camper for the morning nature call and relayed back to me that the loo shovel was missing! We keep a small shovel handy for it’s convenience of size and it’s the only thing we ever leave out at night. Fortunately we had stuck to our ritual of locking all external compartments and the cab for it would seem that with the noisy creek providing cover, a local herders sticky fingers had found our toilet shovel too alluring to pass up. It was all that had been touched but it did remind us of the need to be vigilant. 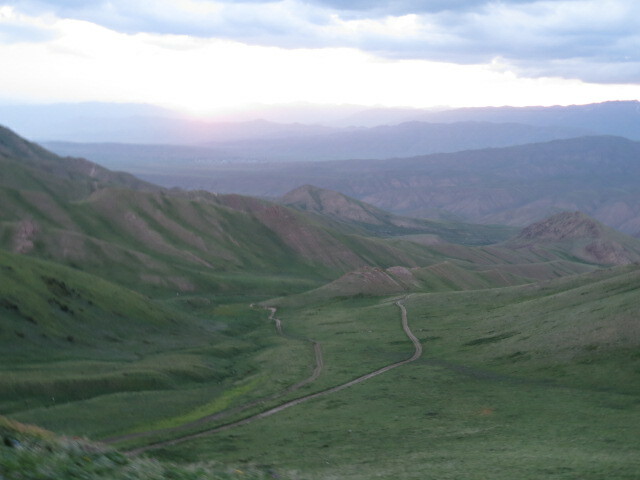 As we continued south the temperature went north, we were now descending from the mountains and into the Fergana valley. You could see the haze associated with the heat for many km’s before it struck and intermittent touching of the windscreen went from cold fingers to cooked fingers in a very short space of time. 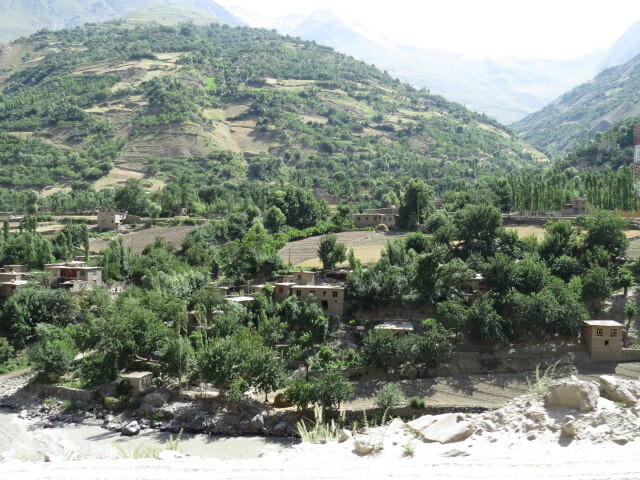 The town of Arslanbob was to be our only real detour enroute to the border, believed to be the location walnuts were first discovered with natural forests of these trees remaining to this day and still being harvested. 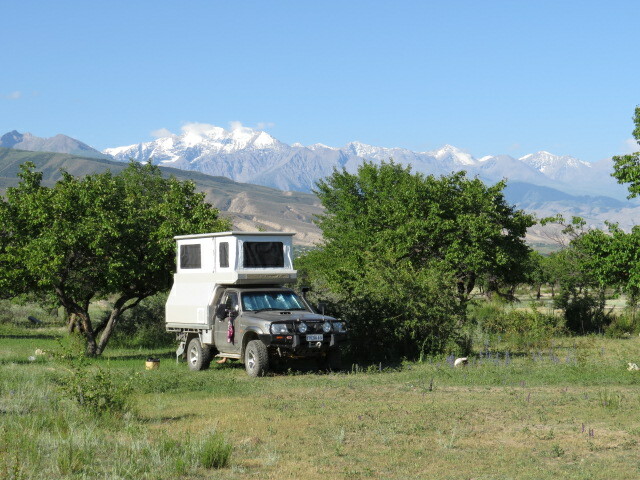 We hoped to be able to camp somewhere near the town, which lies nestled amongst yet another vista of eye catching snow capped mountains. 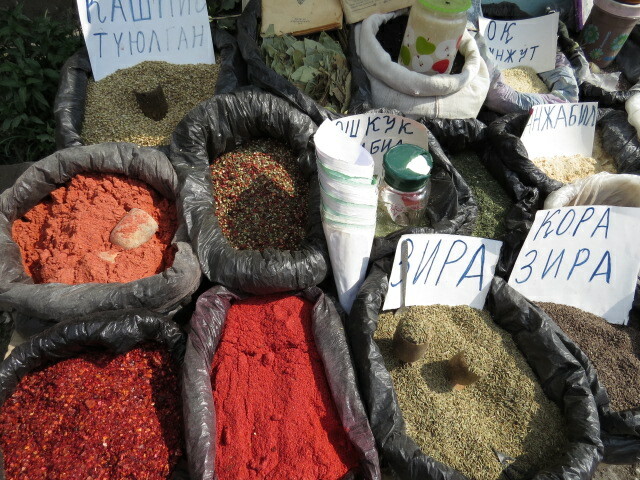 Upon arrival I was immediately struck by the hustle and bustle in the central square market mixed with the aroma of spices and the like, the place was a buzz! 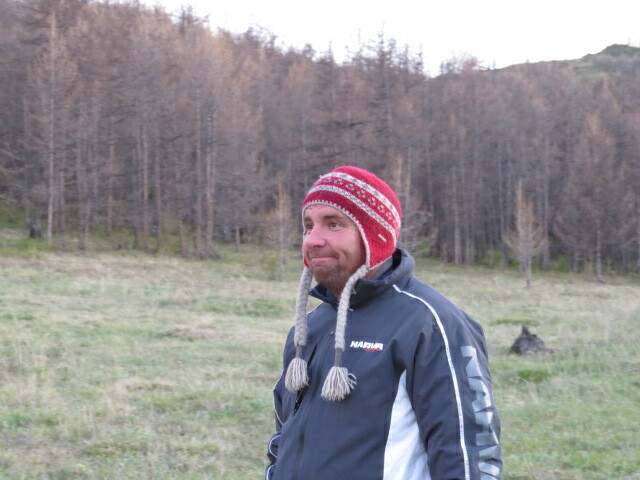 It was late afternoon at this point so we headed a little out of town in the hope of gaining a campsite but weren’t having a great deal of luck, retreating to the town square with the intention of perusing the map again and coming up with a plan. A local appeared at my window and introduced himself as Ibrahim – a CBT representative (Community Based Tourism) and would you believe we’d just read about him in our guidebook! 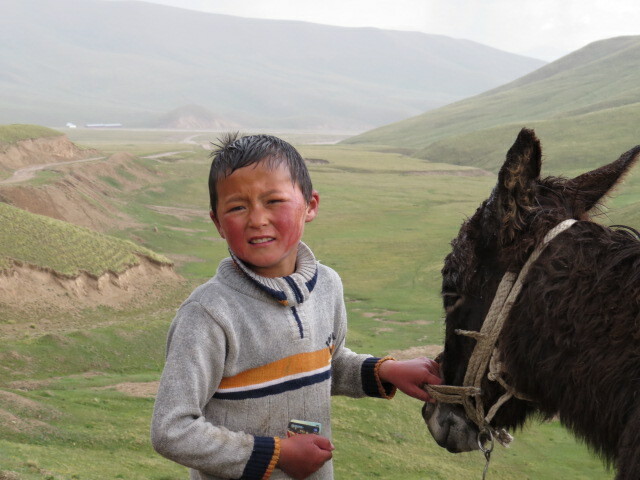 After telling him we were looking for a camp for the night, he promptly gave us instructions to the local animal market, which is only used on Wednesdays so we were in luck. 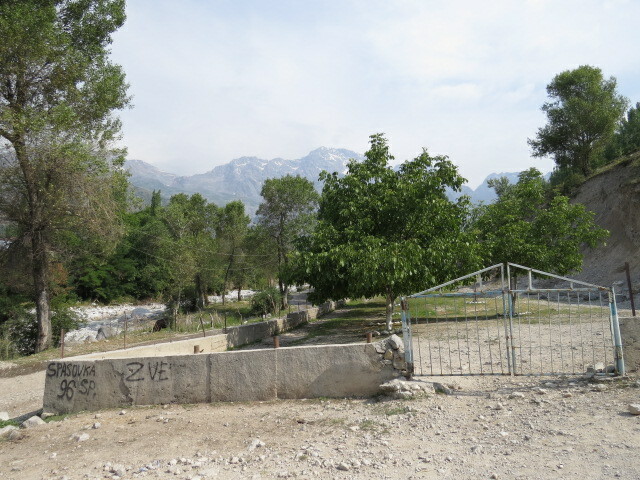 It was all of 200m from the center of the village and with walnut trees to camp beneath and a gated area for the Patrol it was exactly what we needed. 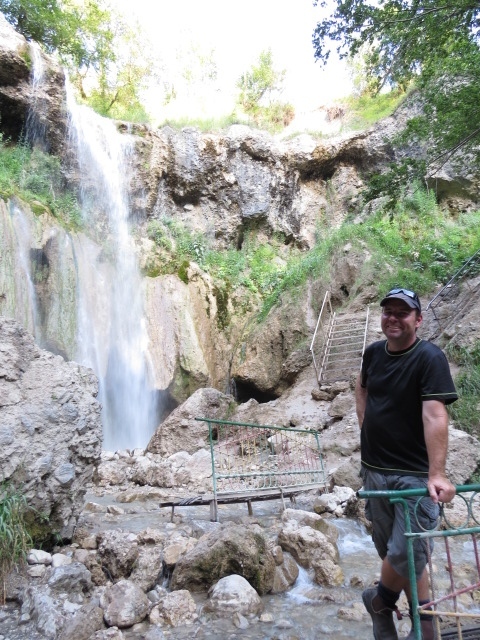 We spent the late afternoon wandering up to a small 25mtr waterfall at the back of the village and knew we were on the right path when it became lined with vendors. 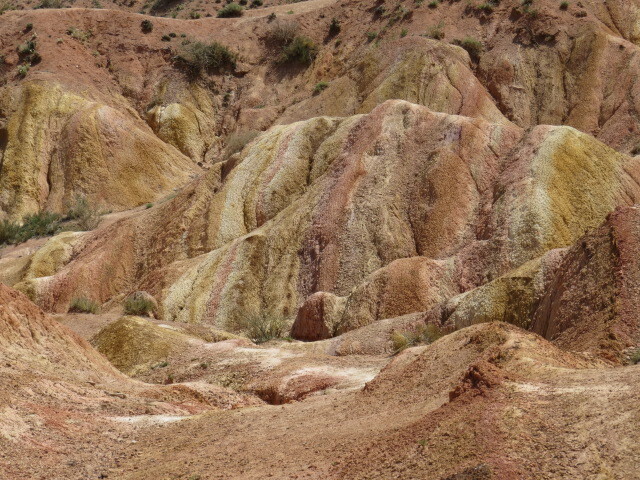 Quite pretty and as luck would have it we departed at just the right time as we managed to grab a lift in a UAZ back to our camp Luckily it was all down hill as the UAZ would only run for a couple of minutes at a time so down hill billy cart style was the order! Into the bazaar the next morning for a wander and a little shopping before we hit the road southwards. 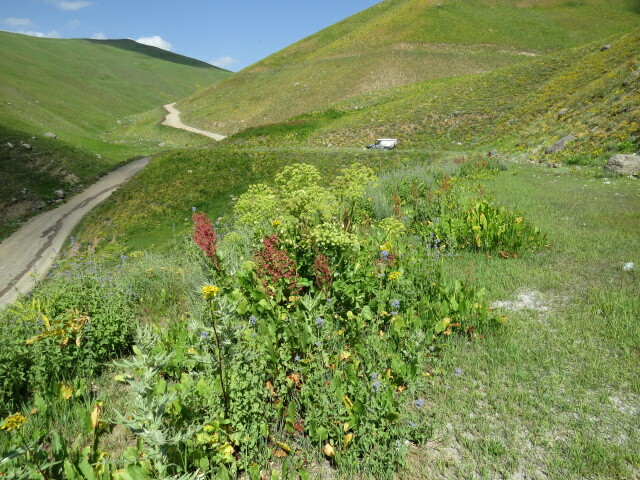 The Fergana valley slid by and we soon found ourselves in the main street of Osh and after finding our way to Jayma Bazaar, we managed to change some $US into Tajik Somoni as we needed some cash before crossing the border. A fairly modern city centre greeted us and we spent a little time looking around town before heading off in search of a home for the night. 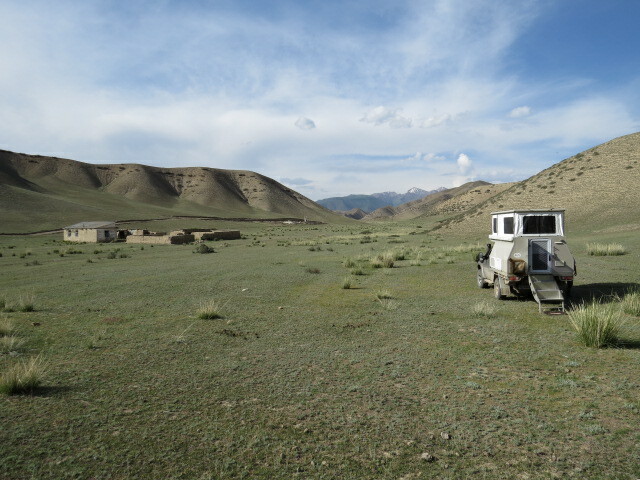 About 30km’s from the border we found a great little spot up a side valley off the highway and although receiving one lone visitor in a Daewoo we were able to enjoy some isolation. 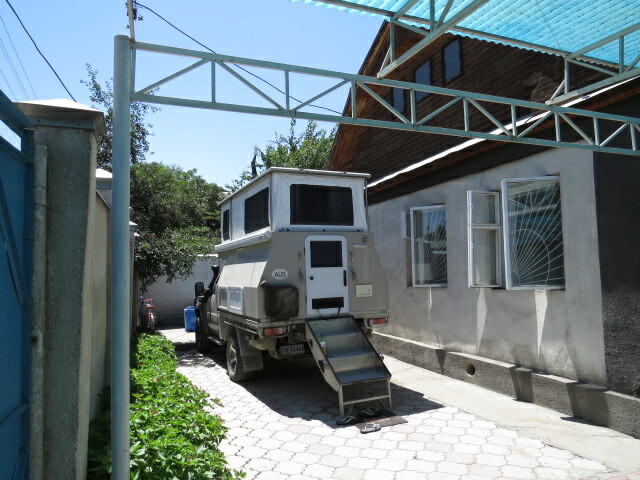 Onward to the border and the Kyrgyz side was quite simple and painless. 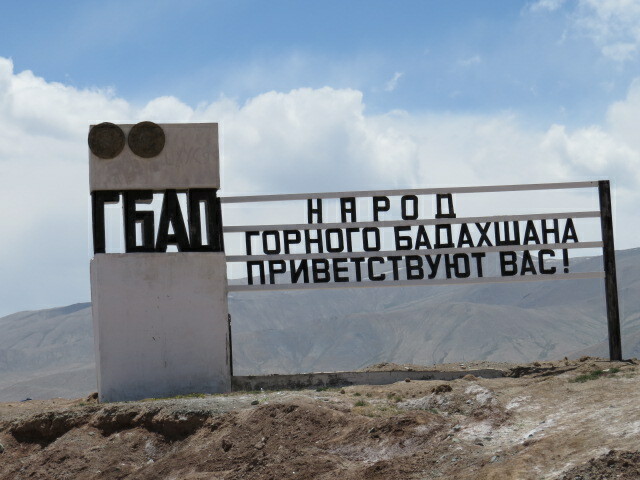 The Tajik Side, which involved quite a steep climb up to 4280m where the crossing is situated, was like something out of the 40’s! Nothing here has been updated for a very long time other than some solar power! The formalities were easy enough but the price gouging was a little offensive – US$60 to have our tyres sprayed with some chemicals from 2 weed sprayers (that I might add has cost little more than a dollar at every other border! ), followed by fee’s for this and that. US$105 later and we were free, well sort of! 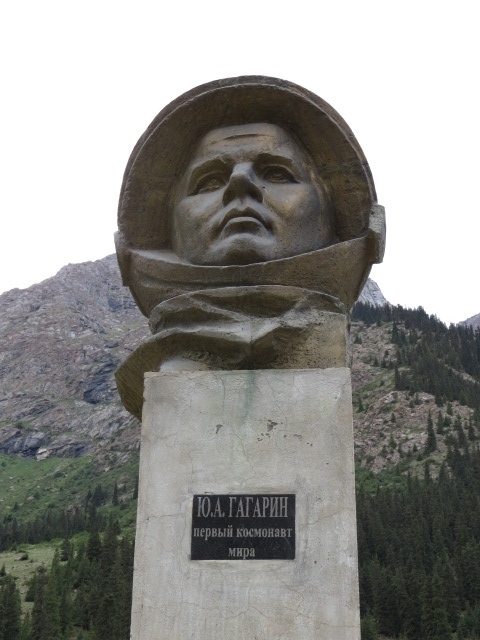 We were only given 15 days validity for the Patrol to remain in Tajikistan, don’t really know why and it didn’t really matter as we figured that would be enough. 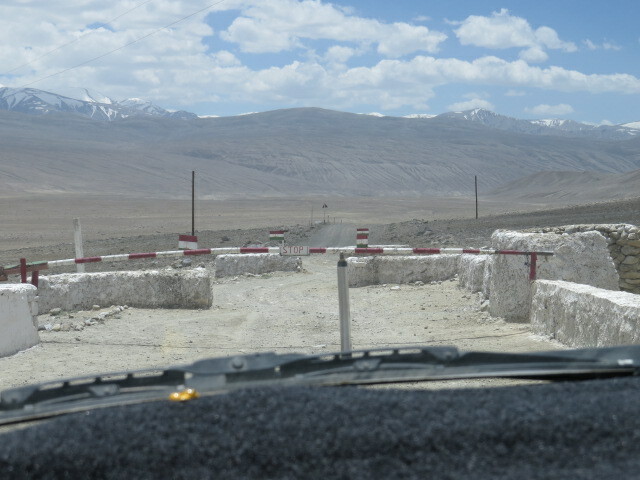 It was really exciting to finally be on the Pamir Hwy! 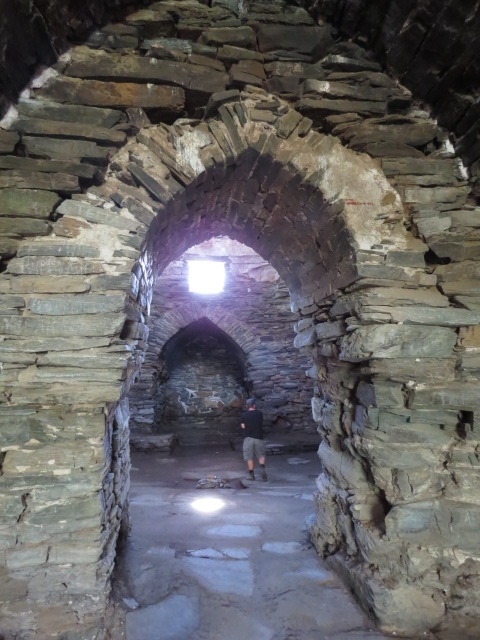 We pushed on and descended to Lake Kara-Kul, which we found very uninspiring. 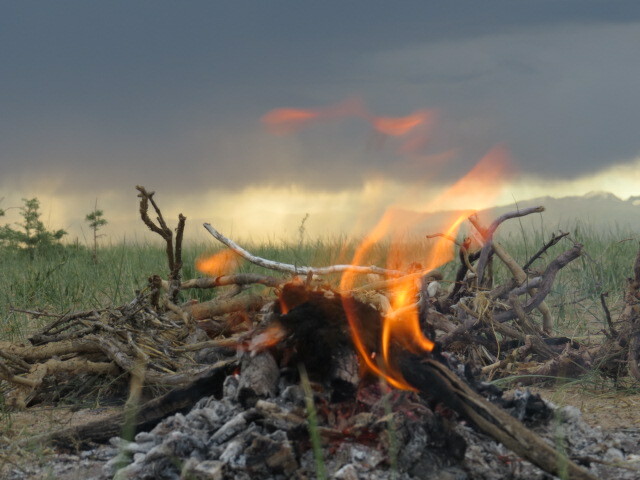 We stopped and chatted with a lone cyclist from Germany for a while and topped up his water but with the mosquitoes in plague proportions we continued a little further and with some perseverance found a reasonable camp about 5km off the main road and out of sight at 4060m. 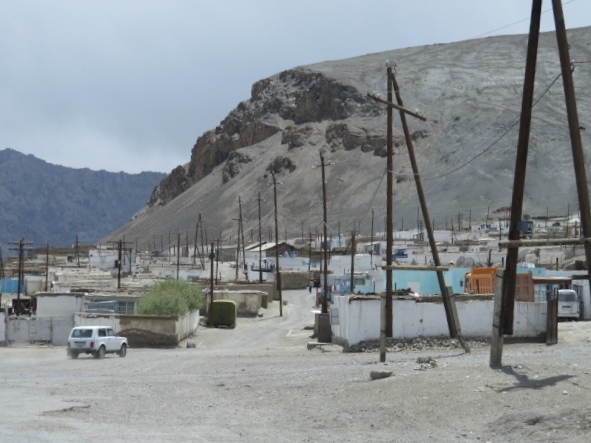 It was our highest camp and quite a jump in elevation – I’m really respectful of altitude sickness and as such had ensured that over the previous couple of weeks we’d been spending time at camps around the 3000m mark. We both experienced very mild headaches that night but that was about it. 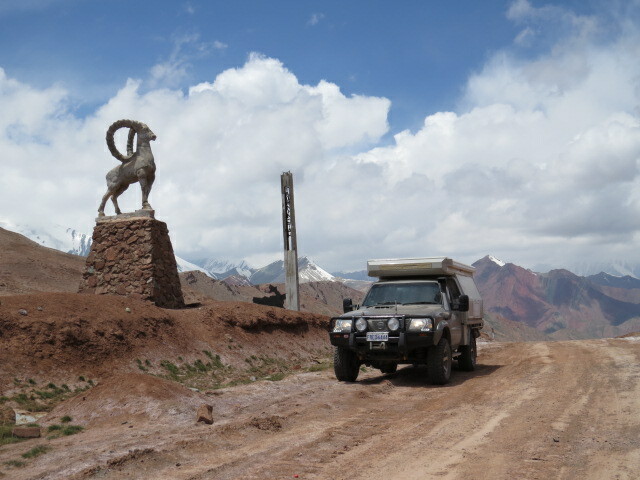 Next morning saw us crest the highest pass on the Pamir Hwy and the trip at 4655m. 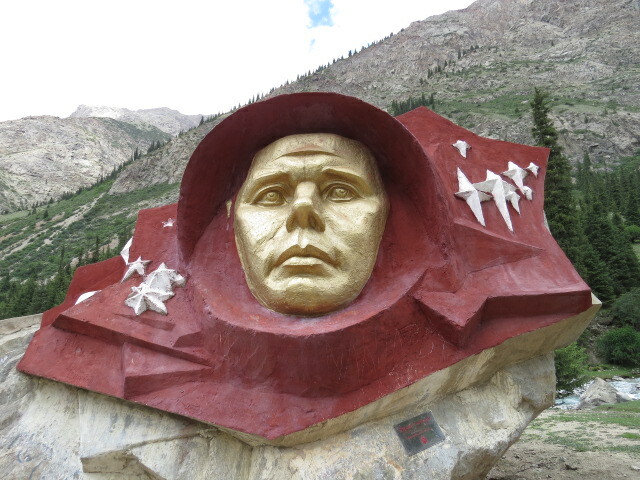 It was spartan and in some ways quite an ugly pass and the scenery along the Pamir so far hasn’t been all that inspiring but given the altitude it wasn’t really a surprise. 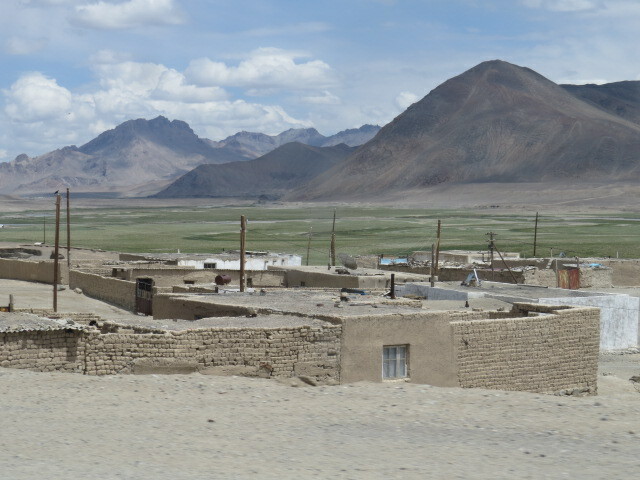 I’d also heard that the Wakhan Valley and Western Pamir region is where the eye candy is so we were content for now! On to the town of Murgab and mud brick homes emerge from the ground and seemingly disintegrate back into it just as easily. I can’t think of a tougher place to live with dust and nothing green in any direction and yet there seems to be no shortage of residents. We managed to pick up 20litres of diesel from an old dilapidated service station and after decanting it into a jerry can and funneling it through an old rag into the tank we were on our way. 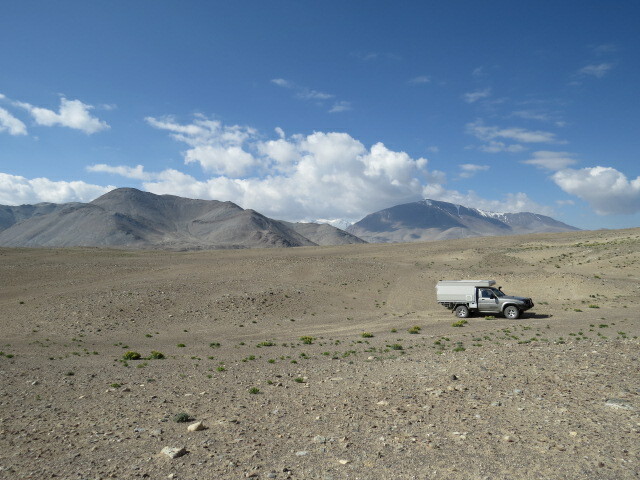 Just west of the turn off to the Wakhan Valley, we made our way 20 or so km to the north of the Pamir Hwy to Yashil Kul Lake. The description we’d read of turquoise blue water with stunning ochre coloured cliffs surrounding the lake was, well, very exaggerated! I don’t want to talk it down however as it’s a beautiful location and served us very well as our home for the evening. A hidden campsite was difficult to find as there is no vegetation but luckily we were able to navigate our way down to the shoreline and find a spot completely out of sight. Anyway we looked at each other and figured they were there for our protection so we should feel safe in that knowledge….? 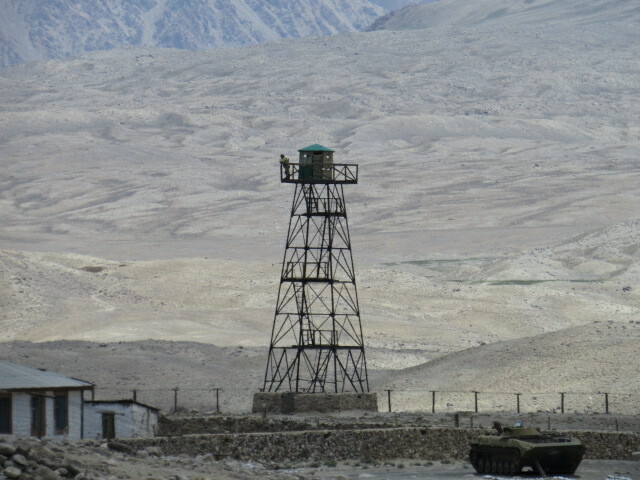 Some time later we descended down to Khargush and the Pamir River which forms the Tajikistan/Afghanistan border. Here there is another passport check and we spent some time waiting to have our information laboriously hand written into a ledger before being able to proceed. The soldiers manning the station were quite friendly and allowed us to check the ledger and see if there were any other tourists ahead of us, it appeared there was one vehicle a couple of days prior which gave us some faith that we weren’t alone! 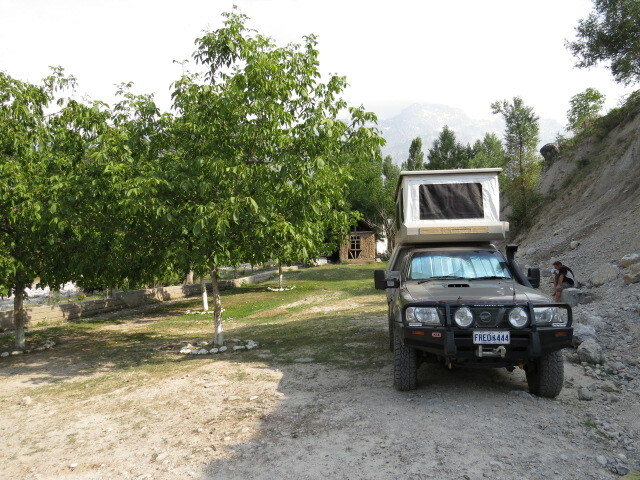 We were now driving along the Afghanistan border and spending most of our time looking into Afghanistan, the Tajik side is generally quite steep next to the track and therefore your eye is inevitably drawn across the river. After a few kms and numerous stops for photo’s we found a fast flowing creek of lovely snow melt water and stopped to fill our water tanks. Out of the car only minutes, we were greeted by a local herder who promptly invited us up to his house for the now familiar milk tea! 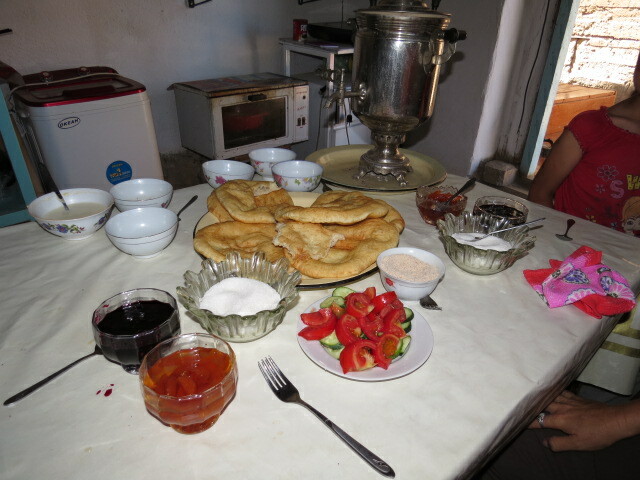 Upon arrival we were met by his wife and with the usual Central Asian hospitality, out came a large assortment of food. First was milk tea and then bread with butter that they had churned themselves, yoghurt and a very strong flavored goat(?) cheese biscuit thing! 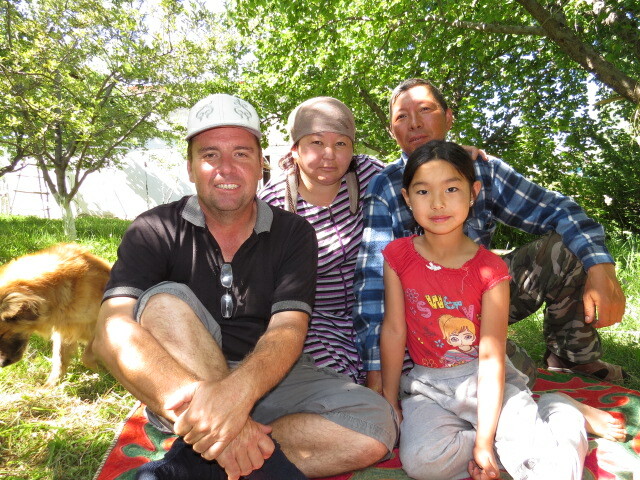 2 of their 3 daughters arrived home from herding the goats and joined us for our discussion of life in Tajikistan. It was a great visit and we found out that they sometimes host bicycle tourists in need of accommodation, which is a great boost to their income. 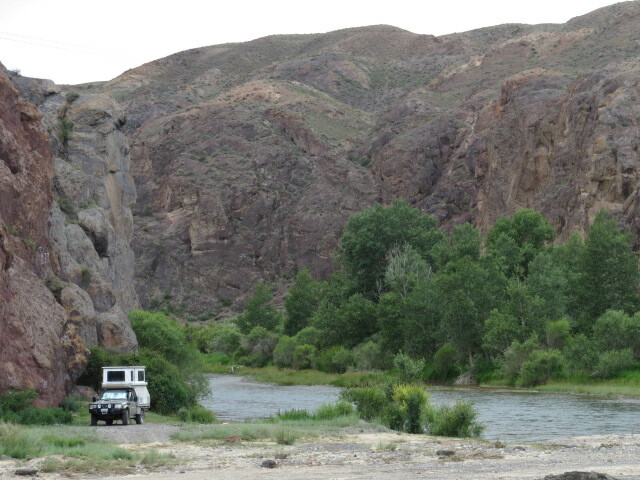 Getting out of sight for the night was again a challenge especially when we had seen an Afghan gentleman in a flak jacket running for no apparent reason on the opposite side of the river but we managed to hide behind some small hills on an old paddock, which served us well. Views across to Afghanistan and the 7000m+ mountains of Pakistan beyond were astounding and we spent some time just soaking up the vista and trying to come to terms with the fact that we were finally camped in this location after all of our planning! 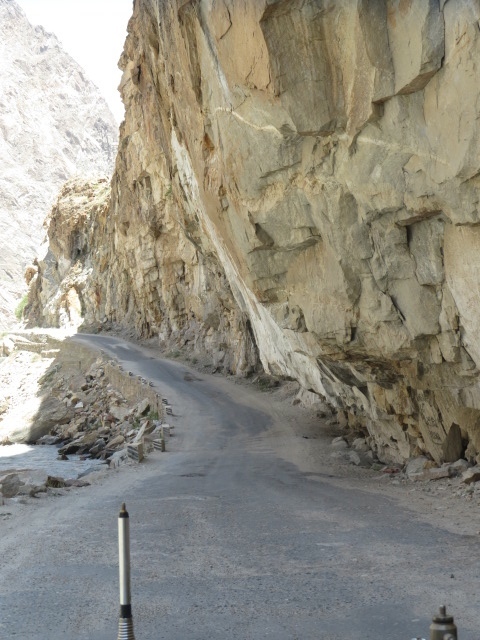 The next day the Wakhan valley began to come alive with fantastic driving mixed with awe inspiring scenery that took your breathe away! 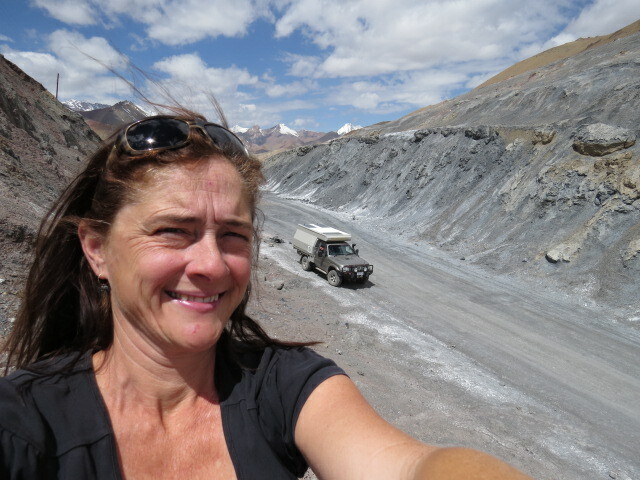 We were now driving along roads that have been cut into the faces of the mountains with, at times, hundreds of meters of very steep scree slope between us and the river. 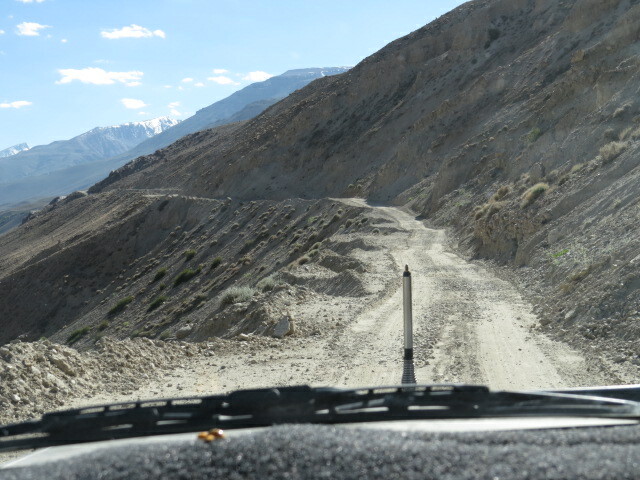 Much of the terrain the road is carved through is conglomerate and looking up at massive rocks that seem only to be held in place by a little mud smattered around them is very disconcerting! I know they come down regularly as you can see them strewn all over the place but I guess you’d have to be unlucky….??!! 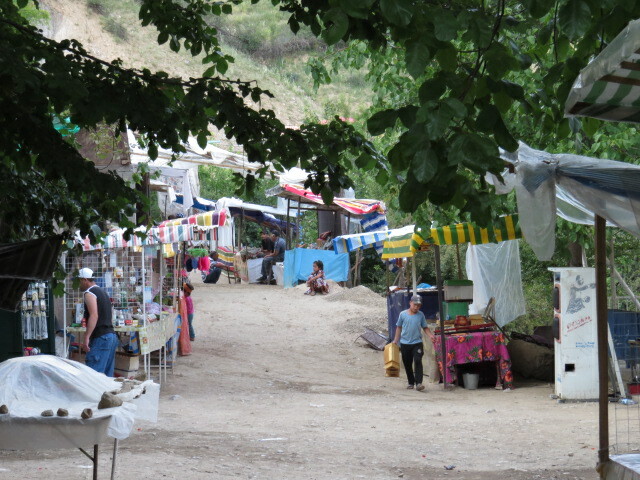 Slowly the valley thickens with inhabitants and townships, lots of home stay signs and the odd small shop. 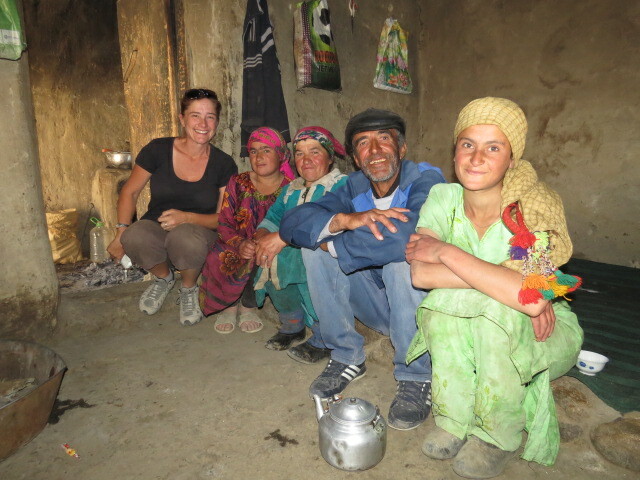 The people of the Wakhan are amazingly friendly; you actually end up with a sore arm from waving back at all the locals! Our day consisted once again of many stops for photo’s and relaxation and included a fantastic detour up a very steep and quite narrow track encompassing many tight switchbacks to ancient Yamchun Fort – certainly the best to be seen in the valley with remnant watchtowers and an incredible cliff top location. A rapid gain in elevation provided stunning views of the valley and if not for the wind we’d probably have camped up there. 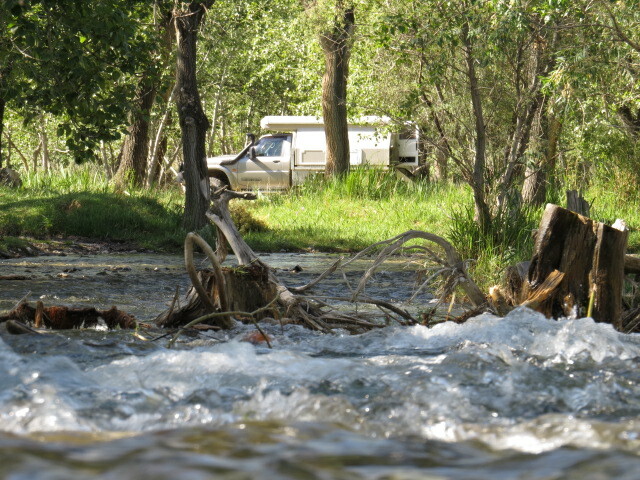 Campsites were again a little tricky and we settled on a low spot along the river amongst some shrubs, which left us just visible to the road. 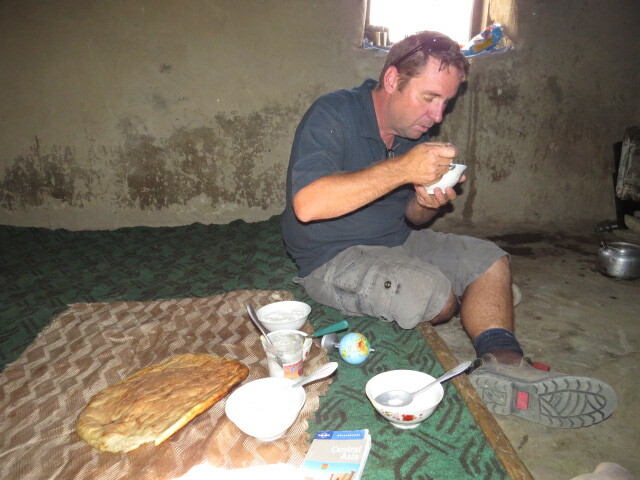 Just settled in for dinner and the Tajik army spotted us and informed us that it wasn’t safe as we were too close to Afghanistan and should move on and stay in one of the towns. They were looking out for our safety I guess but to put you in perspective there isn’t anything on the other side of the river except very steep mountains and hardly any settlements of any sort. We finished dinner and began packing up, Jen said did you hear that and my response was “Yep – that was a high-powered rifle!,” followed closely by 2 more rounds sailing off somewhere into the valley! 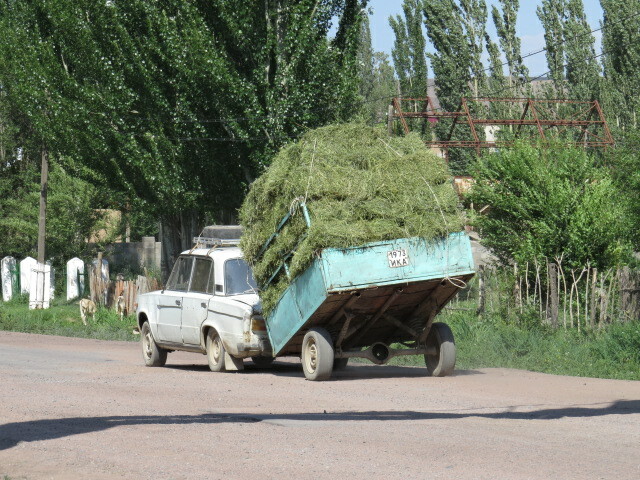 We packed up with a little more purpose at this point and pulled back onto to the road and as we did the Tajik army were on there way back to make sure we’d moved on. Anyway it was probably just a farmer letting a few rounds go, I imagine if it had been cross border action there would have been more than 3 rounds but it still put the wind up us a little. It was now dark and after about 10km the next town appeared and we parked in someone’s yard behind a bus stop! No one bothered us and that was the end of the excitement. Majestic mountains are the backdrop of the Wakhan -Afghanistan and Pakistan look equally inviting as you travel along the river, it’s hard not to be inspired by the view. 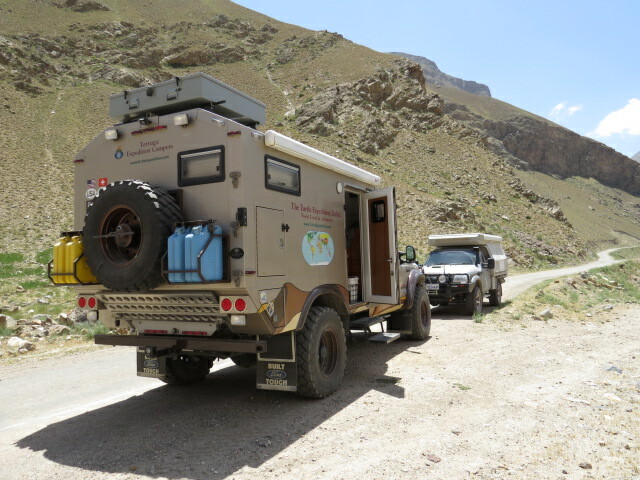 The last stretch of the Wakhan and we were now heading toward Ishkashim and Khorog and to date we hadn’t seen another overlander! However after rounding a bend we came head to head with the Turtle Expedition. 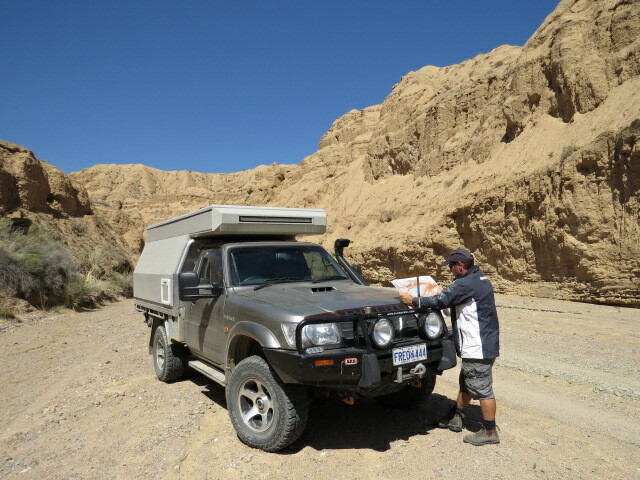 If you have experienced overland travel or are thinking about it and have been spending some time perusing the net then you more than likely have come across these guys. Anyway if you haven’t then here is their website – take a look! 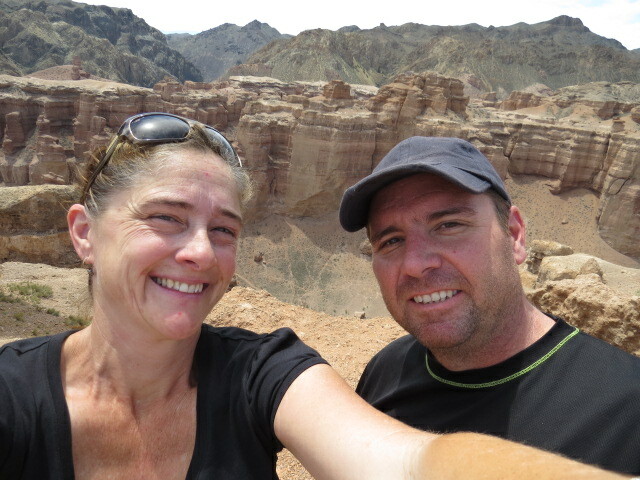 Being familiar with Gary and Monika’s travel history and their current journey meant meeting them was a real bonus for us as they are a wealth of information. 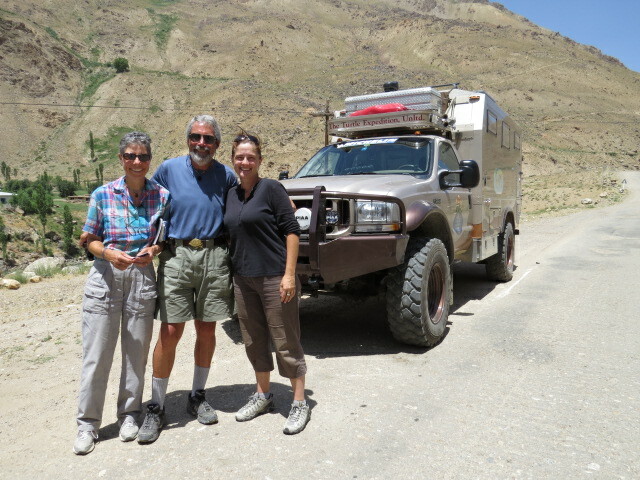 We ended up spending a couple of hours on the side of the road with them sharing stories, discussing our vehicle setup and swapping suggestions regarding our respective itineraries and hope to see them again. 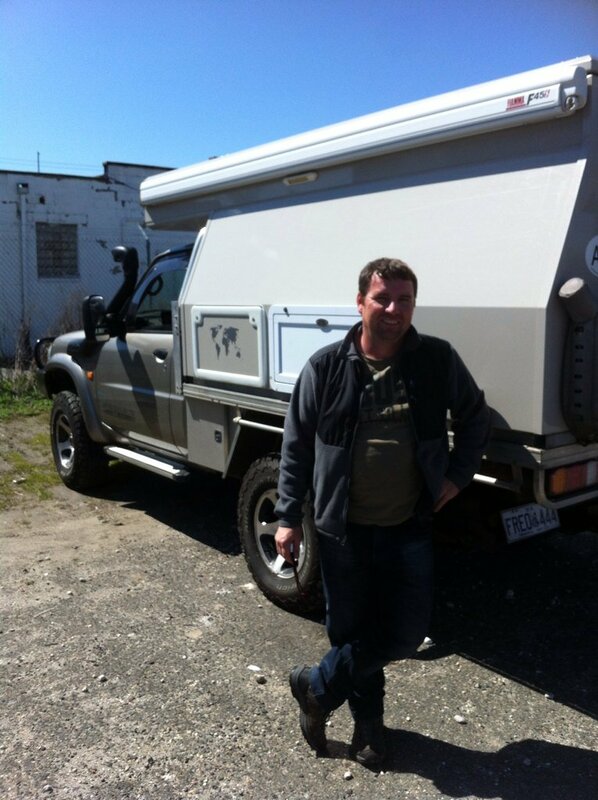 Maybe in the US at Overland Expo! 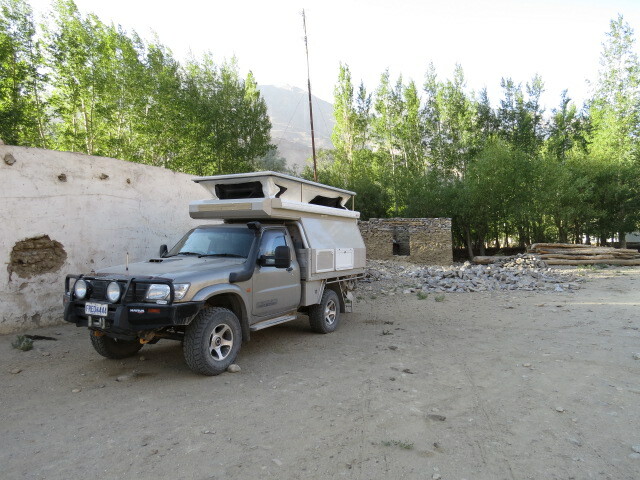 Gary and Monika had given us some great advice regarding Khorog such as where we could park, get internet and the like – we take this info when we can as it can be a challenge finding these things on your own! 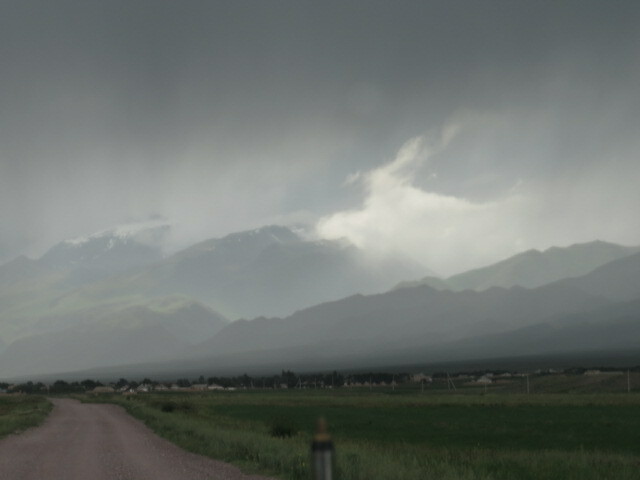 Back on the road toward Khorog and another passport check came into view but this one turned out to be a little ugly. I exited the Patrol with passports in hand as I always do and was greeted with some locals sitting around the office obviously insulting me in the local dialect, no problem I just insulted them in my dialect and all was Ok! 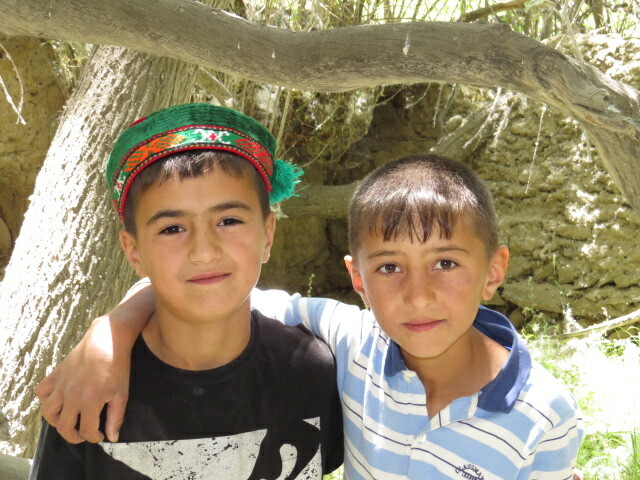 Whilst I was in the office with the first unfriendly Tajik I’d met, Jen was in the car and unbeknown to me a camouflage wearing individual and then a local in his usual goat herding attire were attempting to get her to open up the camper, she could see them making gestures to others behind the vehicle in the rear view camera and they were watching to see that I was still inside the office. Jen knew they didn’t have any right to look inside the vehicle and when they became quite aggressive she gave them a firm NO and proceeded to ignore them until they gave up! I didn’t know about this until I was back in the Patrol and by then they’d all scurried off. Only a couple of hours earlier Gary and Monika had told us that Monika always does any type of paperwork check whilst Gary locks the doors and stays in the truck, the local men aren’t as comfortable dealing with women and are less likely to become difficult, so our strategy has now changed and we follow theirs! So far the new strategy is working a charm! 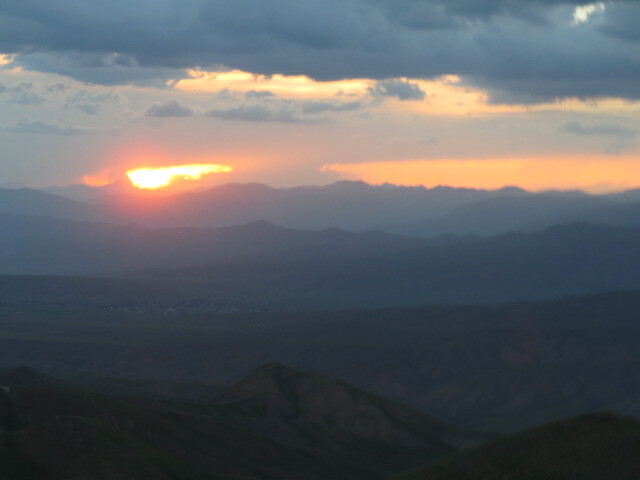 It was late afternoon by the time we made it to Khorog so we decided to camp and head into town the next day for a look around. 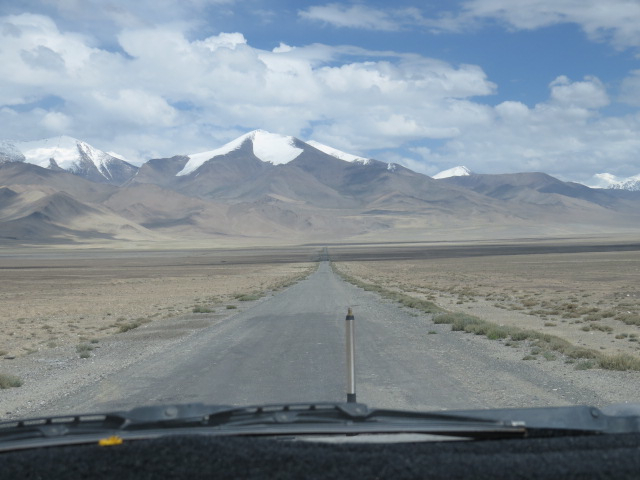 We drove up the Pamir Hwy back to the east for about 40km as we wanted to have a taste of this section of the Pamir Hwy as well and figured we’d had enough of camping on the Afghanistan border…. 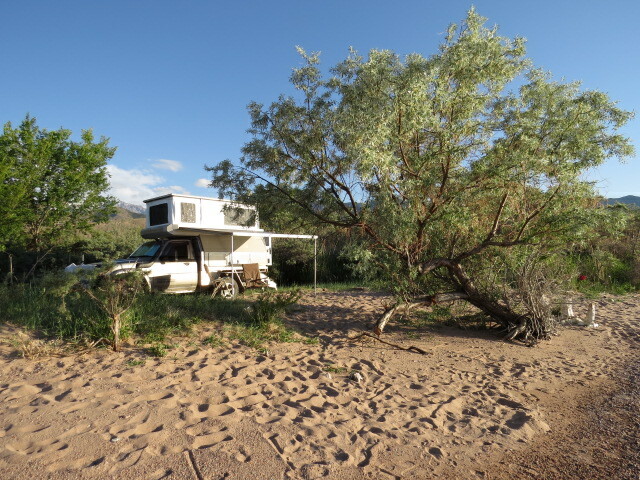 It was looking a little tricky until I noticed a rough and ready soccer pitch as we passed through a small town, a track leading in was found and camp set. A few locals wandered by during the afternoon, they had an assortment of farm animals tethered around the ground for the day and were in the process of retrieving them as evening approached. 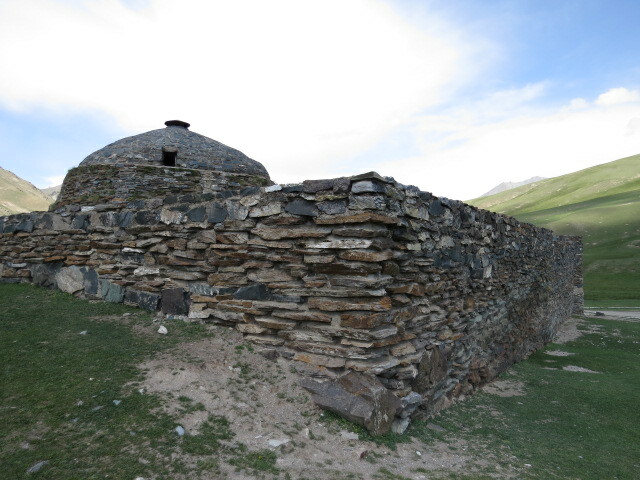 Khorog is the location where most of the violence seems to occur between different local clan’s and is the area that has the most direct bearing on whether the GBAO permit is suspended. Due to the publicity, which is always negative around this town, we were expecting a war zone. The plan had been to get in, get fuel and get out! 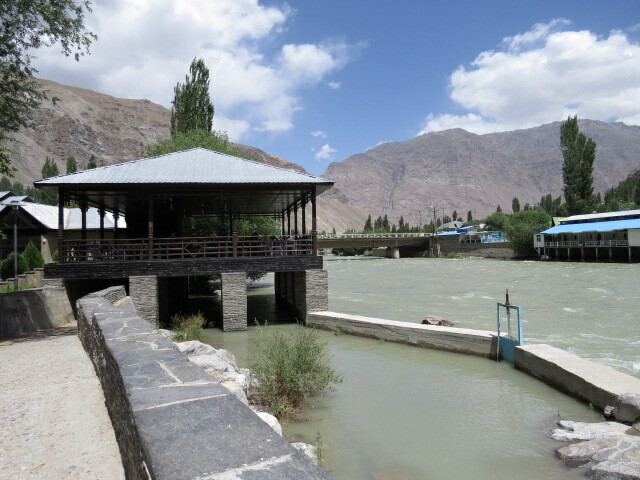 To say we were wrong would be a big understatement, Khorog turned out to be as friendly as the Wakhan, laid out with lovely parks and cafe’s, a public swimming area teaming with families cooling off in the mid day sun and generally a warm and welcoming vibe! There is however no doubt this town has suffered its share of bloodshed even as recently as mid June and probably will again. 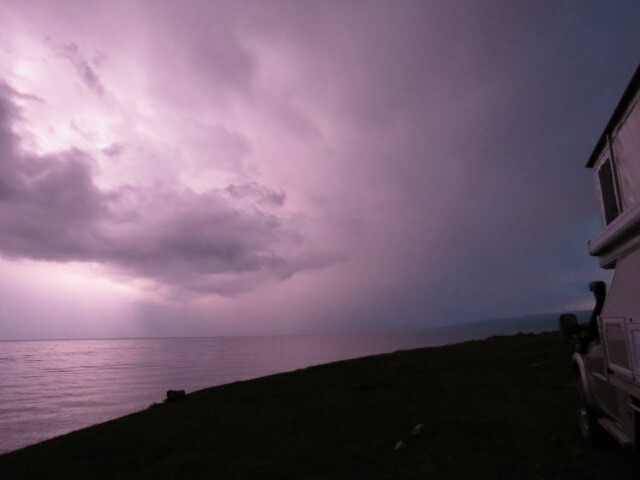 The tranquility we encountered makes you realize just how fast things can change. 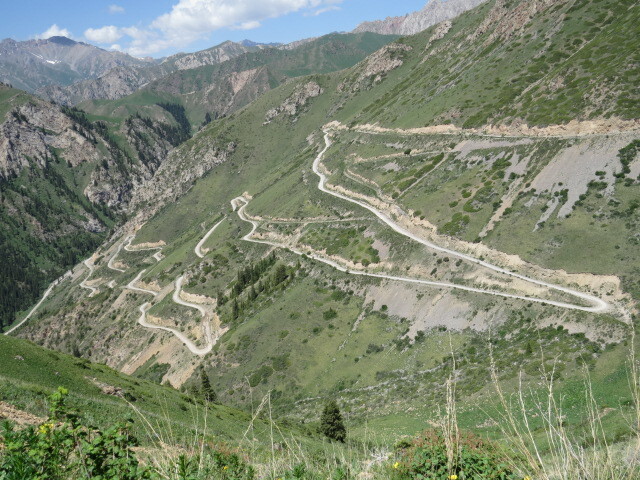 Continuing toward Dushanbe we enjoyed the now spoilt feeling of having too much lovely scenery, an easy day resulting in camp being found up the Bartang Valley and about 10km from the Afghanistan border. 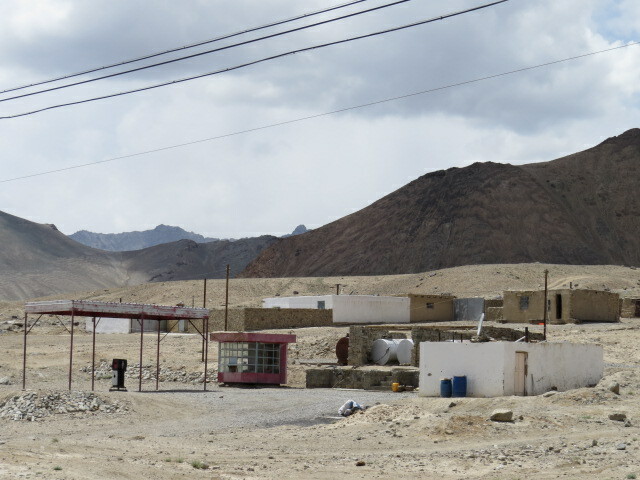 We were hoping to continue toward Dushanbe along the Pamir Hwy (the M41) but had been told that the road was closed and we’d need to travel a longer route to the south on the newer all year road. 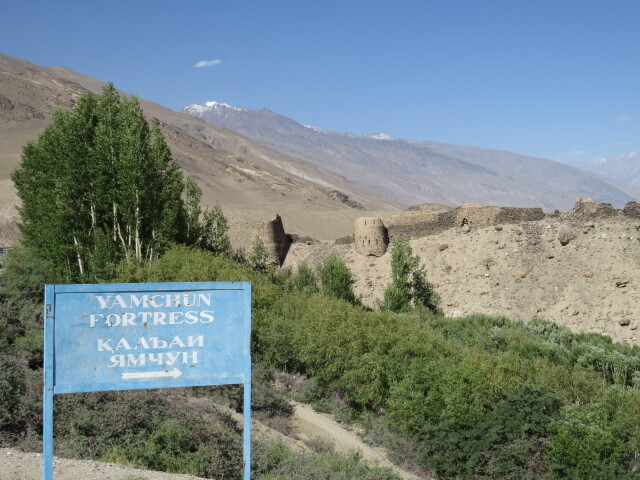 We were disappointed at this news, as I’d been led to believe some of the best scenery lies along the main Pamir Hwy. Disappointment was short-lived however as we found the road had been reopened and although in poor condition we would be allowed to traverse it! 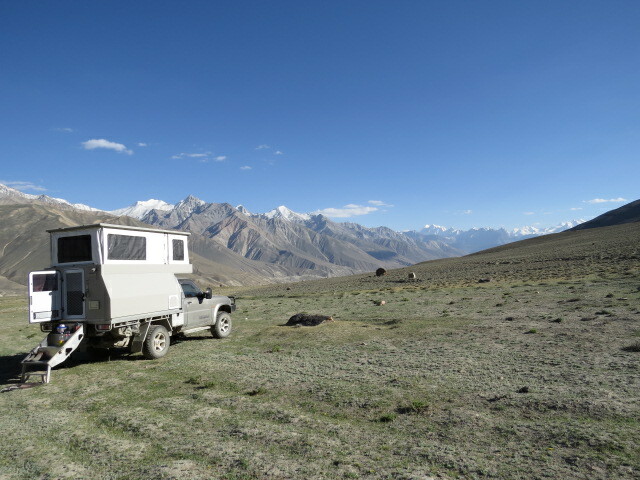 The road didn’t let us down and did provide some of the most amazing scenery whilst affording us a respite from the rising temperatures as we were able to camp at around 3000m again and enjoy some cool night air! 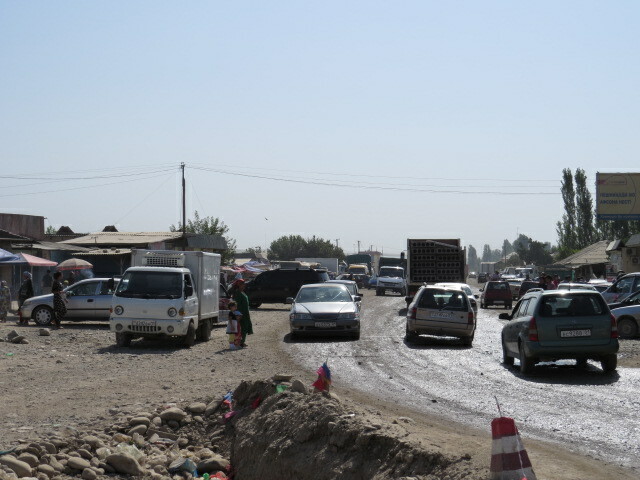 Eventually the road improved and as we got closer to Dushanbe the traffic became fast and furious as it does in this part of the world! 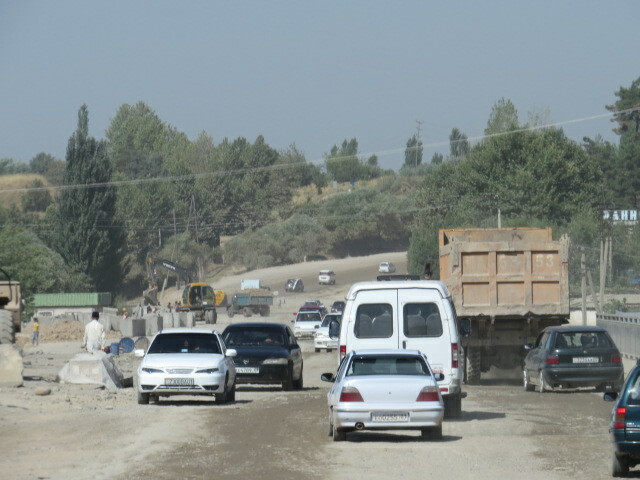 We had our first of 2 police stops along this road as, aside from the frequent passport checks, to date we hadn’t even drawn a Police officers eye in Tajikistan. 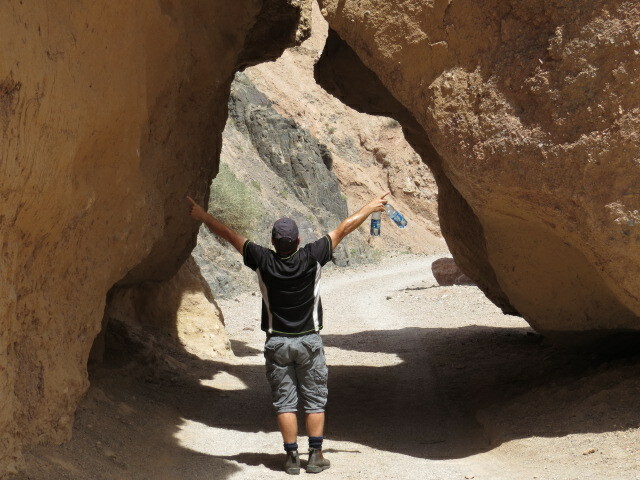 The first stop ended as abruptly as it began – as soon as he realised we were tourists he just waved us on! The second was a little different, Jen jumped out as per our new strategy and after a brief discussion he wouldn’t deal with her and made his way to my window, beginning with the usual handshake he then proceeded to point to the speedo suggesting I’d been speeding! I pointed to the in-car camera and said your on it and that was the end of that, he slithered back across the road to his patrol car and we departed! 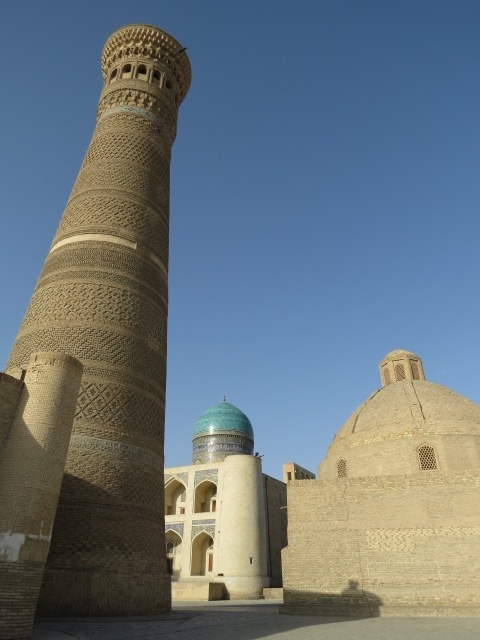 I didn’t find the city overly inspiring and it was very hot which probably didn’t help so we pretty much made a transit and continued toward Uzbekistan. 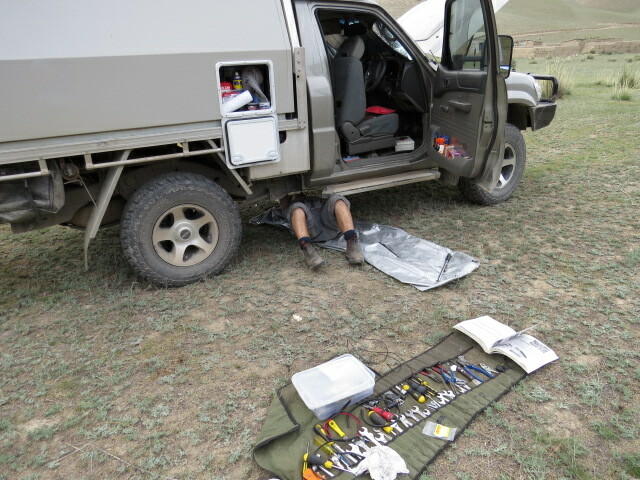 We fuelled up as close to the border as we could and made camp around 20km from the crossing. 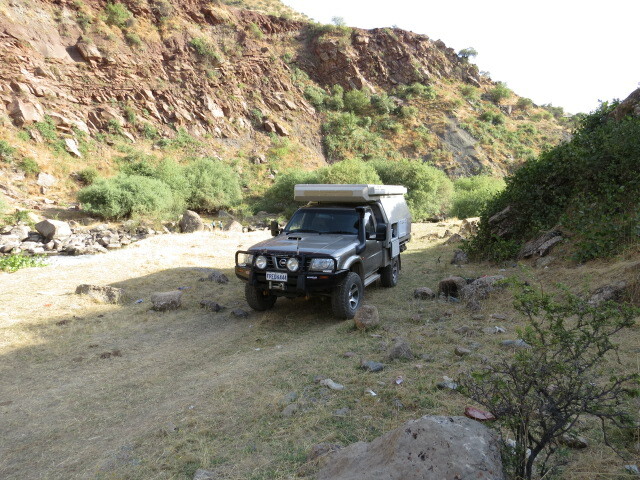 Jen gets credit here as she found a road up a valley and located us a great camp on a fast flowing creek between some villages and completely out of sight. 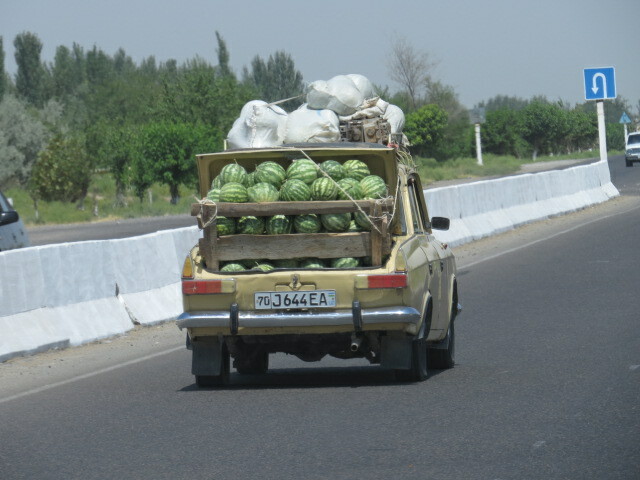 You can never have too many watermelons! 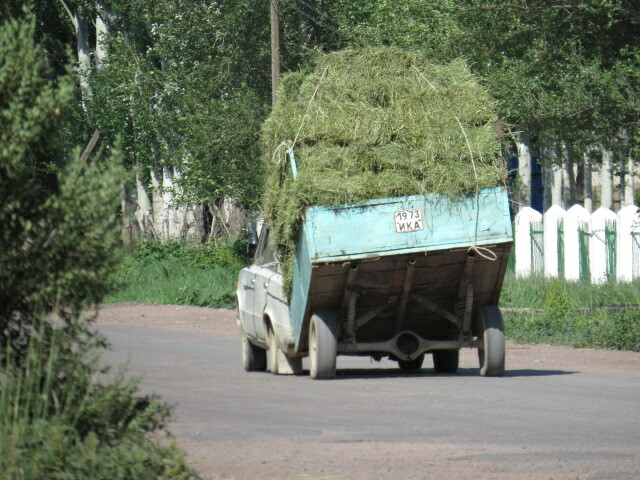 Crossing into Uzbekistan was very efficient and consisted of a lot of paperwork. The Patrol received a full X-ray scan followed by sniffer dogs and a physical search! You have to list all foreign currency you are in possession of and should you try and leave the country with more than that declared it will be confiscated! The rules go on and on and there was a moment when I wondered if it was worth the hassle? Depends who is interpreting the rules but to stay on the safe side you are not allowed to camp and must hotel it every night and receive a registration stamp from the Hotel! It’s a shame that these rules are in place as we passed many great campsites in the first 200km of the border crossing and I’ve no doubt we would have spent a lot more time and money here had we had a little more freedom! 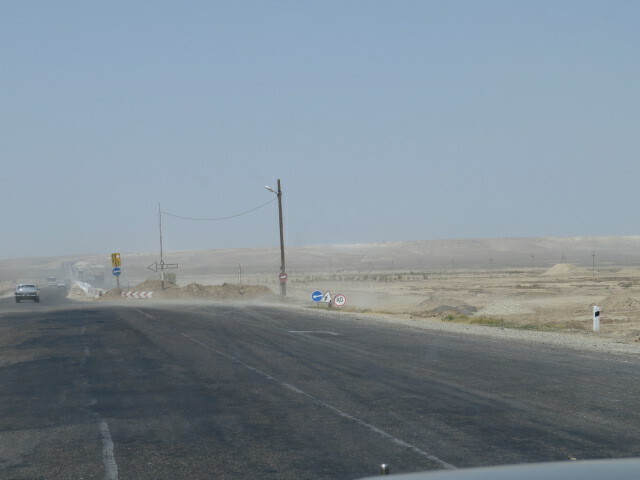 Driving toward Qarshi where we hoped to find some accommodation was like being in hell! Dead flat whitish landscape with mid 40 degree temperatures and the land sporadically peppered with large chimneys emitting the flame associated with gas production, it was very eerie! 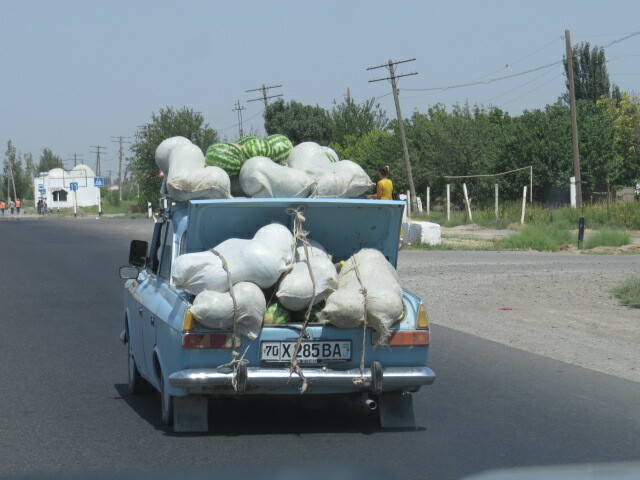 As Uzbekistan has large reserves of gas most vehicles are or have been converted to gas powered and hence diesel and even petrol can be hard to find with many travellers having to resort to buying it from roadside vendors selling it in recycled plastic water bottles! Our information for Qarshi was non existent so we drove around a little looking for somewhere to stay and eventually found a local hotel but unfortunately the establishment also has to be registered in order to accept foreigners so we were out of luck! 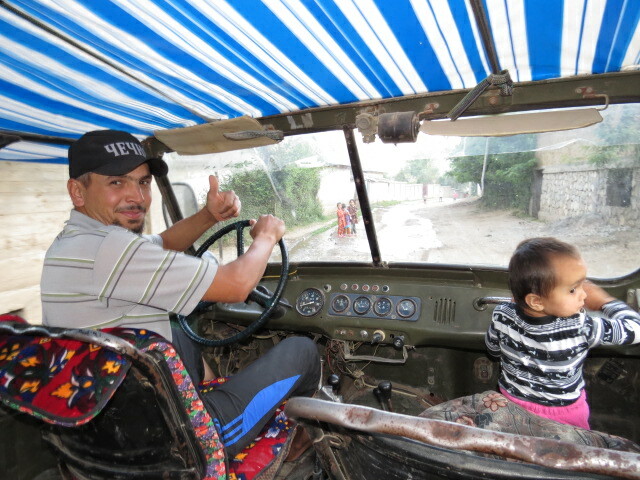 Jen met a restaurant owner whom in realizing our needs insisted on piling into the Patrol with us (yep 3 in the cab again!) and proceeded to direct us to some Hotels, quick goodbye’s and he was on his way!! How nice was that! 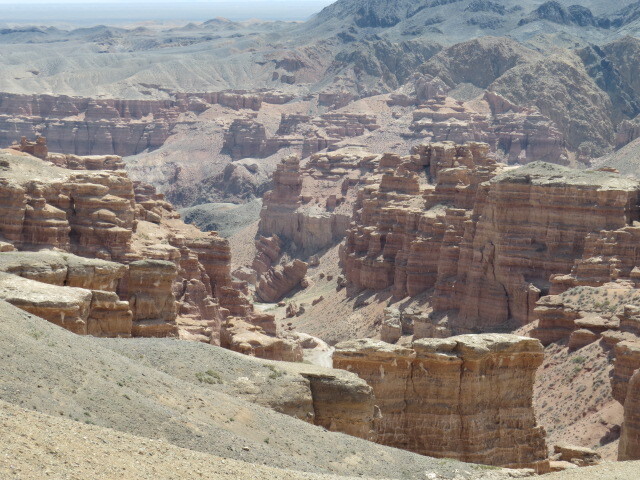 The heat and flat terrain persisted and then we were treated to strong wind squalls laden with dust. 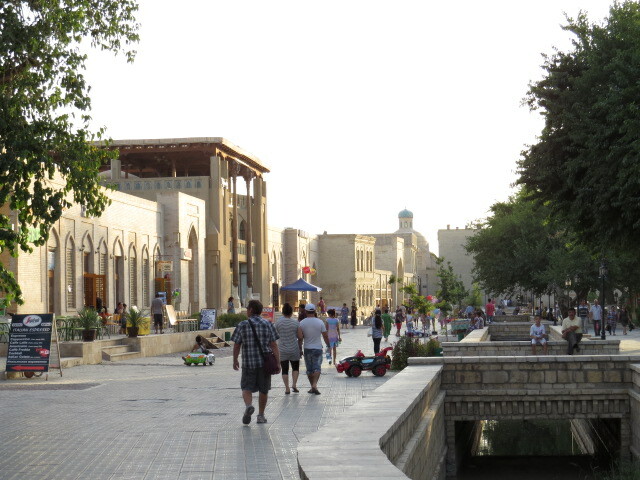 Bukhara came into view and with it the terrain relaxed back into friendly surrounds with trees and greenery. I don’t know how we managed it but we ended up parking 100m from the accommodation we’d booked before deciding we were in the wrong place and moving a little further away, Jen asked a local shop owner for directions and yep you guessed it! She locked up her shop and there were 3 in the Patrol again, she directed us right back to where we’d previously been parked! We located the Salom Inn Hotel on foot and after parking the Patrol in a secure parking lot settled down to a cold beverage and a wander around this very old and interesting city. Dinner was had at Minzifa rooftop restaurant with the sun fading to a red hue as it dipped below the desert and the hassle of entering Uzbekistan seemed to be a distant memory! 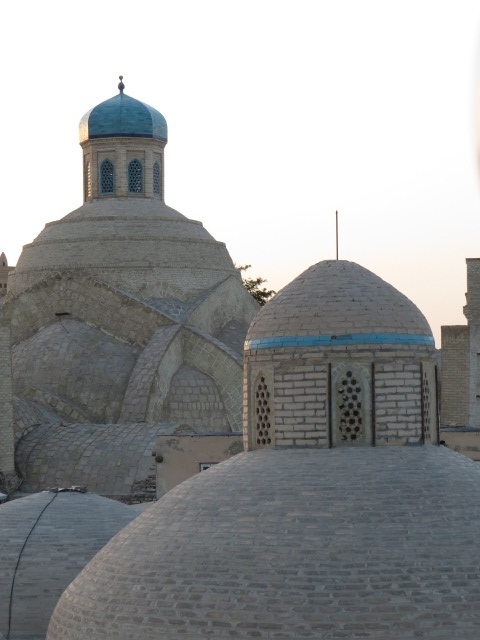 We had a great couple of nights in Bukhara and wandering around the old city was absolutely sensational, I’d be lying if I didn’t mention the fact that it’s definitely been tricked up to encourage the tourist dollar but the atmosphere was absolutely warm and welcoming and the detour to this ancient city was well justified. 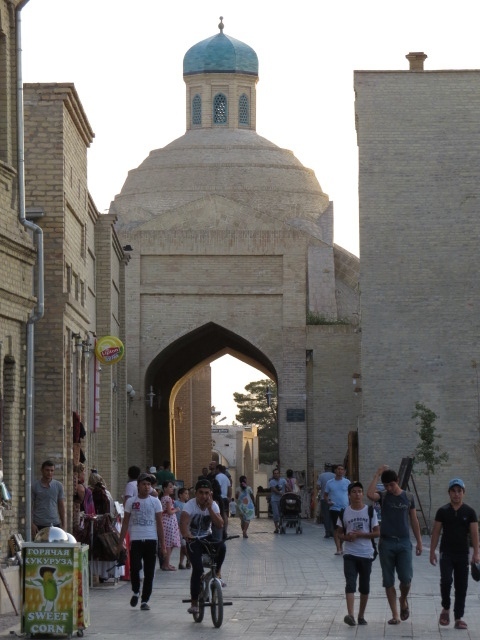 We are now in Samarkand staying at the Emir B&B and have spent the day looking around this more modern city. I’m a little Mosqued out to be honest and tonight will include some cold drinks and a relax. 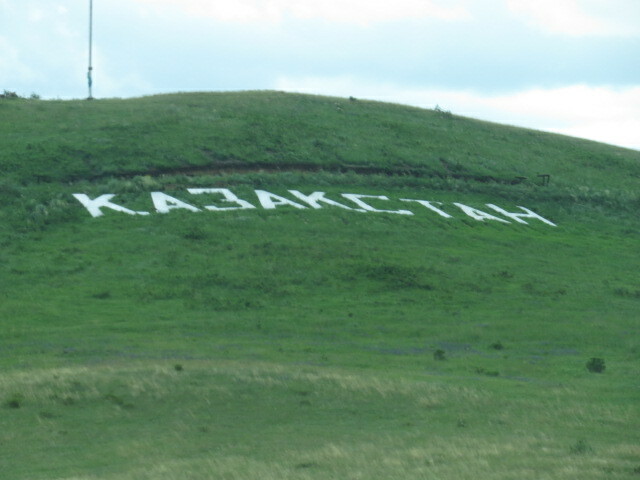 Tomorrow we head for Tashkent and then back into Kazakhstan and no doubt the next experience with the Police Academy cadets! Looking forward to that…. 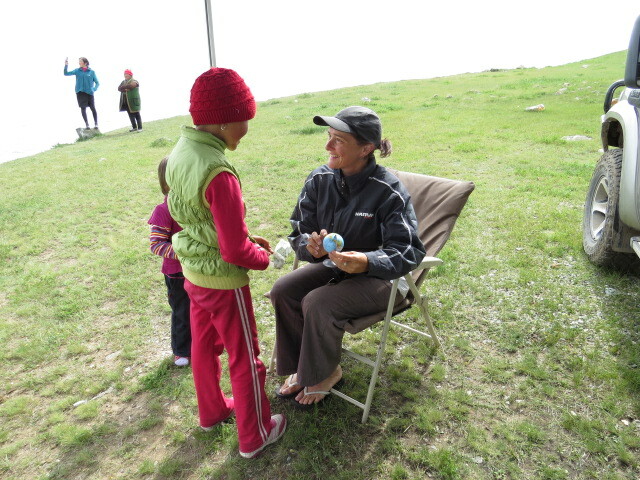 This entry was posted in general, Kyrgyzstan, NARVA, Tajikistan, Uzbekistan, Visas on July 27, 2014 by Jen. For those of you who have been following our posts you would have noticed the reference to me as a muppet when I deleted one of Justin’s draft posts! A fairly deserved comment in the circumstances but I couldn’t resist a little shot back…. This entry was posted in general on July 7, 2014 by Jen.